Will you survive the first activation? They just landed after a cross-ocean flight from the UK to NY. The pilot cannot reach the ground and has to perform an emergency landing. What they find when they land is just the beginning. 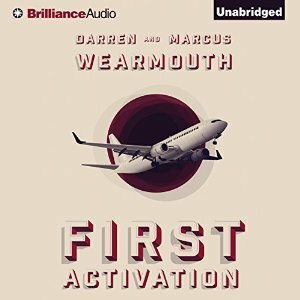 Follow two brothers as they discover what has happened to people while they were in the air and try to figure out what exactly is going on. The narration for this was really enjoyable. I honestly didn’t realize going into this that the book was from the point of view of two British brothers – so the fact that the narration was done in a British accent was a total shock to me. But, I’m glad it was. It added a lot to certain scenes where a word or phrase was said and either they didn’t understand it, or the people around them were unsure what they meant. It helped me really get into the story. James Langton has a great voice and used it in numerous ways in the narration of this book. He voices different characters differently so you as the listener are more confused. The quality (both performance and recording) were excellent. Top notch with no issues. The story really got me from the first chapter. When they are on the plane waiting to land I just knew something was going on. The thing that I really enjoyed is that this was unlike any other “post-apocalyptic” story I’ve ever read. I like when I’m presented with a story that I have never read or watched before. Usually, when reading a story, I compare it to other movies or tv shows I’ve watched. But this one had nothing to compare it to. This uniqueness made me fly through this book. I also enjoyed the two brothers who are the main characters in the story. They are both a likely and totally unlikely set of protagonists. Seemingly normal and thrown into extraordinary situations you find out who these brothers really are. The other characters that you meet along the way all add to the story and all felt necessary to the story. There were numerous times when I thought I had the story figured out, and I was wrong every time. A great mix of thriller and post-apocalyptic survival. This story has it all. A great read/listen from beginning to end. All I can say is I’m glad I have the second book in the series queued up right now. Harry and Jack are military veterans, but they've never encountered anything like this.